Bean salad is a great dish to have when the weather is hot. It’s cool and refreshing, and can make a nice meal when served on shredded lettuce. And it’s quick and easy to make. I like to use green beans, white beans of some kind, and kidney beans for a variety of color, but you can use any kind of beans you like. 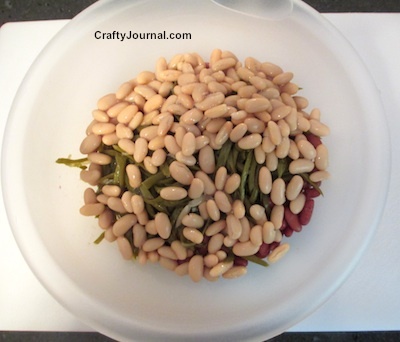 How to Make Bean Salad. 1. Open each can of beans and drain. If the liquid on the beans is cloudy, as some beans such as kidney beans are, rinse the beans and drain. 2. In a large bowl, add the beans. 3. Chop the bell pepper into bite size pieces and add to the bowl. 4. Cut the onion in half length wise, and slice into thin rings. Add to the bowl. 5. Pour the apple cider vinegar and olive oil over the beans. Add the sugar, salt, and pepper. Pour the bean salad into a bowl just large enough to hold it, so most of the ingredients will be in the liquid. 7. After a few hours, stir the salad so all the ingredients can marinate. To serve, alternate layers of shredded lettuce and bean salad.